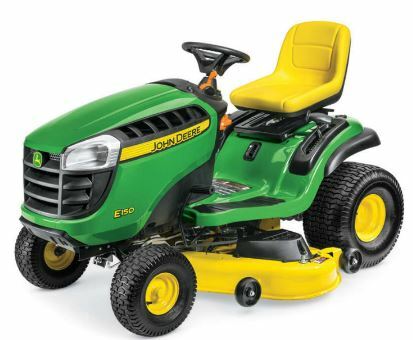 Hello Guys, Want to buy a Buy a lawn mower in the USA from John Deere Tractors from the 100 Series lawn mowers? But, have no idea which one to buy? This post can helps you the most in doing so. 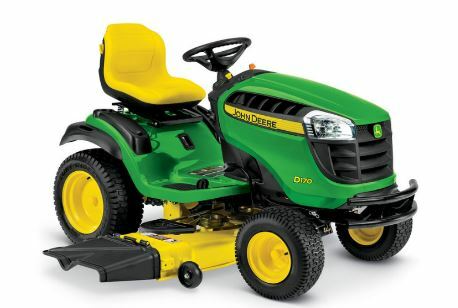 In this post, you can get prices of all John Deere Lawn Mower tractors from the 100 Series. In this post, you can also get all the key specifications with the engine, transmission, steering, attachment, Manual, backhoe attachment, craigslist and other keys features details. 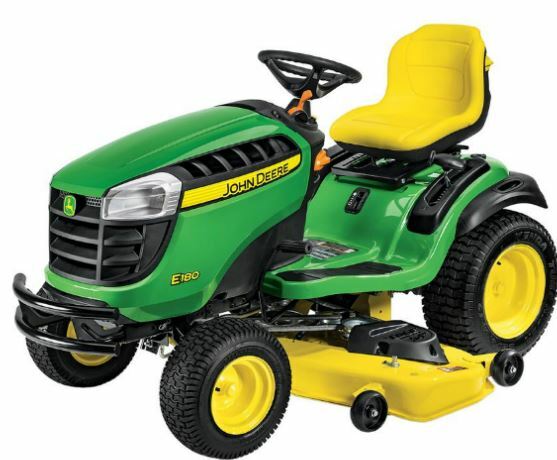 Check out all the prices of all lawn mowers tractors from John Deere 100 Series. 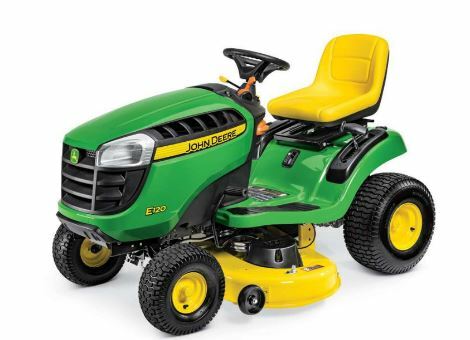 Designed with Deep deck, which helps in lifting the grass for a superior cut. Featured with an Improved deck to lift lever and also lowers deck easily. Powered by a wide and comfortable Operator station. Loaded with Powerful battery, which helps to start even after heavy storage. Gasoline fuel support with air cooling system. Bendix type as the engine starter. Automatic and continuously variable transmission (CVT) type transmission system. Sector & pinion type steering with single drag link and tie rod steering. Side discharge mower deck with a Slide under tractor mower attachability. 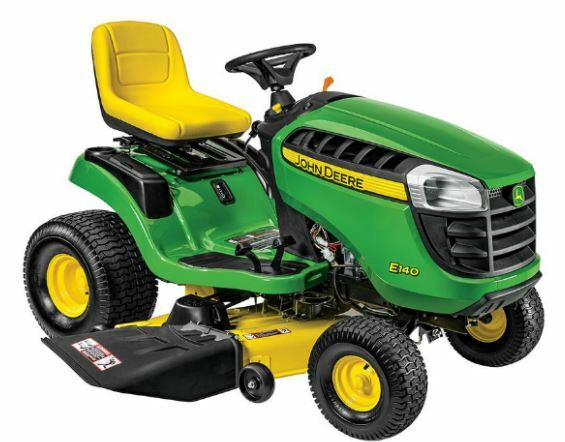 Standard mower, Rear bagger, Front blade, Snowblower, Sprayer, Two-bar styled front bumper front bumper, Snow cab for weather protection, Sun canopy, Grass striping, and Bucket holder as the optional equipment. Designed with a Deep deck which is helpful in lifting the grass for the superior cut. Manufactured with a wide and comfortable at the Operator station for the operator comfort. Re-designed deck to lift lever up and the lowers deck easily. Fuel tank capacity of 2.4 U.S. gal. or 9.1 Ltr. Gasoline fuel support. Air cooling system with a Cartridge as the air cleaner. Facility of Engine starter, Hour meter, Headlights is available. Hydrostatic transmission system, 2-wheel drive. Mechanical fuel gauge which is viewable from the seat. Mechanical governor with One lever choke and speed control. Two-foot pedal for hydrostatic controlled. A sector, pinion type steering with a single drag link with tie rod steering. Internal wet disk type braking system. Front axle made up of Cast-iron and powdered metal front for the wheel bushings. Fins with a fan on the transaxle as the oil cooler and oil filter. Side discharge mower deck made up of Stamped steel deck shell along with Slide under tractor mower attachability. UV resistant JD Loy hooding material and Storage tray for storage with an optional cover. Tilt seat suspension with two coil springs. A lever on fender deck for the lifting purpose. Manual power take-off (PTO) with the Single belt drive system. Standard mower, Mulching system, Rear bagger, Front blade, Spreader, Sprayer, Snowblower, Sun canopy, Snow cab for weather protection, Bucket holder, Lawn striping kit for grass stripping as optional equipment. 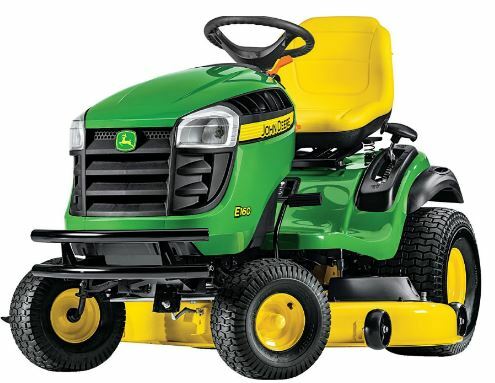 If you want to E120 lawn tractor, then it is a good idea. 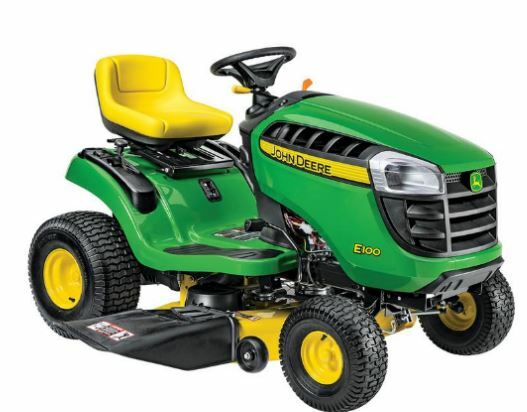 The price of E120 lawn mower tractor is $ 1,899.00 USD. Overhead valve, oil filter, full-pressure lube, 20 HP, V-Twin cylinder smooth running engine. Designed Deep deck for easy grass lifting and for the superior cut. Improved deck to lift lever and the lowers deck easily. Easy Change: 30 Second Oil Change System which aids fast & simple service. Gasoline fuel supports having fuel tank capacity of 2.4 U.S. gal. or 9.1 Ltr. Mechanical governor with One lever speed control. Air cooling system with Cartridge as the air cleaner. Mechanical fuel gauge with is viewable from the seat. Facility of Bendix type as an engine starter, Hour meter with service reminder, and Two standard headlights made up of incandescent. Fins with a fan on the transaxle as the oil cooler with oil filter which is not serviceable. UV resistant JD Loy hooding material. Internal wet disk brakes. And, front axle made up of Cast iron and powdered metal for the front wheel bushings. Manual PTO (power take-off) with a facility of Mower wash port. Storage tray for the storage purpose with covers. Sector and pinion with single drag link and tie rod type steering. Two mower wheels with one bolt Mower wheel adjustment. One piece seat with Tilt seat suspension having two coil springs. Side discharge mower deck made up of Stamped steel deck shell, 13 steel gauge. And, Slide under tractor as the mower attachability. 2 bag Rear bagger, Standard mower, Mulching system, 46 in. Front blade, Sun canopy, Bucket holder, 2 stage Snowblower, Sprayer, Spreader, snow cab as the Weather protection, and Lawn striping kit for the Grass striping as the optional equipment. Overhead valve, oil filter, full-pressure lube, 22 HP, V-Twin cylinder smooth-running power engine. Front axle made up of Cast-iron and powdered metal for the front wheel bushings. Designed with a Deep deck which is helpful in grass lifting and also for the superior cut. Facility of Bendix type as the engine starter, Two standard headlights made up of incandescent, and an Hourmeter with service reminder. Two-foot pedal controlled for hydrostatic control along with standard cruise control. Air cooling method along with Cartridge as the air cleaner. Hydrostatic and 2 wheel drive transmission system. Fins with a fan on the transaxle along with an oil filter, which is not serviceable. E-coat primer with powder paint for long life and durability of the tractor. A wide and comfortable operator station for the operator comforts and safety. Side discharge mower deck made up of Stamped steel deck shell, 13 steel gauge. And, Slide under tractor mower deck attachability. Manual PTO (power take-off) with Two mower wheels. Facility of Storage tray for the storage purpose with cover. Sector and pinion steering with single drag link and tie rod type steering. Facility of RIO (Reverse Implement Option). Standard mower, Mulching system, Sun canopy, 46 in. Front blade, 2 bag Rear bagger, Bucket holder, Sprayer, Spreader, 2 stage Snowblower, snow cab for the Weather protection, and the Lawn striping kit for the Grass striping as the optional equipment. Facility for the easy oil change: 30 Seconds Oil Change System for a fast and a simple service. Overhead valve, full-pressure lube with oil filter, 22 HP, V-Twin type cylinder, smooth running and powerful engine. Supports Gasoline as the fuel having fuel tank capacity of 2.4 U.S. gal. or 9.1 Ltr. Cartridge air cleaner in the air based cooling system. Facility of oil filter along with Fins & fan on the transaxle. One lever speed control with a mechanical governor. Two foot pedal for the hydrostatic control. Stamped steel as the Fender deck material and UV resistant JD loy hooding. Storage tray for storage with an optional cover and Floor mats for the debris channels removing. Facility of Bendix type as an engine starter, Two standard headlights, and Hour meter with the service reminder and 12-V outlet as the Optional accessory. CargO Mount as the mounting equipment. A lever on the fender deck for the lifting purpose. Electric PTO (power take-off) with clutch and Mower wash port. Facility of Reverse Implement Option for the operator safety and security. Sector and pinion type steering with a single drag link and a tie rod on the steering. Front axle made up of Cast iron and powdered metal front for the wheel bushings. Side discharge mower deck, Constructed with Stamped steel deck shell, 12 steel gauge. Single belt drive system with Slide under tractor mower attachability. 2 bag Rear bagger, Sprayer, Spreader, Mulching system, Sun canopy, 46 in. Front blade, Bucket holder, Standard mower, snow cab for the Weather protection, Lawn striping kit for the Grass striping and 2 stage Snowblower as the optional equipment. Facility of a high back seat, which is easily adjustable. V Twin cylinder engine with the Mechanical governor and one lever choke and speed control. Gasoline fuel supported tractor having fuel tank capacity of 2.4 U.S. gal. (9.1 Ltr) gasoline. Internal wet disk brakes with the Cast-iron front axle and front axle of powdered metal for the wheel bushings. Tilt seat suspension having two coil springs. Hour meter with service reminder and standard headlights made up of incandescent. Standard cruise control with Two-foot pedal for hydrostatic control. UV resistant JD loy hooding and Stamped steel for the fender deck material. A Sector, pinion type steering along with single a drag link and tie rod on the steering. An air-based cooling system with Cartridge as the air cleaner. Facility of 12-V outlet as an Optional accessory. Facility of oil filter with fans and fins on the transmission as the oil cooler. Facility of wide and comfortable operator station for the operator comforts and safety. Storage tray for the storage with cover and Floor mats for the debris channels removal. 2 bag Rear bagger, 46 in. Front blade, 2 stage Snowblower, Bucket holder, Mulching system, Sun canopy, Standard mower, snow cab as the Weather protection, Sprayer, Spreader, and the Lawn striping kit for the Grass striping as the optional equipment. Four numbers of mower wheels with one bolt mower wheel adjustment. Overhead valve, oil filter with full-pressure lube, 24 HP, V-Twin cylinders, extended life series power engine. Facility of Bendix type as an engine starter, Two standard headlights, made up of incandescent and Hour meter with the service reminder and 12-V outlet as the Optional accessory. One piece seat with the lumbar adjustment having tilt suspension with two coil springs. Four numbers of mower wheels. Cartridge with prefilter as the air cleaner in the air based cooling system. HST (Hydrostatic) transmission system. And, Internal wet disk type brakes. Standard mower, Sprayer, Mulching system, Sun canopy, 46 in. Front blade, Spreader, snow cab as the Weather protection, 2 stage Snowblower, Bucket holder, 2 bag Rear bagger, and Lawn striping kit for the Grass striping as the optional equipment. Facility of a Deluxe high back seat with lumbar support, which is easily adjustable. Overhead valve, full-pressure lube, oil filter 24 HP, V-Twin extended life series power engine. It Supports Gasoline as the fuel having fuel tank capacity of 2.4 U.S. gal. or 9.1 Ltr. Facility of Two standard headlights made up of incandescent, Bendix type as an engine starter, and Hour meter with the service reminder, Reflectors as Taillights or reflector,12-V outlet as the Optional accessory. Mulching system, Standard mower, 46 in. Front blade, snow cab for the Weather protection, Bucket holder, Sprayer, Spreader, 2 stage Snowblower, 2 bag Rear bagger, Sun canopy, and Lawn striping kit for the Grass striping as the optional equipment. Overhead valve, oil filter with full-pressure lube, 25 HP, V-Twin cylinders, extended life series power engine. Facility of Reflectors as Taillights (reflector), Bendix type as an engine starter, Hour meter with the service reminder, Two standard headlights made up of incandescent, and 12-V outlet as the Optional accessory. 2 stage Snowblower, 2 bag Rear bagger, 46 in. Front blade, Standard mower, Mulching system, Sun canopy, Spreader, Bucket holder, Sprayer, snow cab as the Weather protection, Lawn striping kit for the Grass striping, etc as the optional equipment. 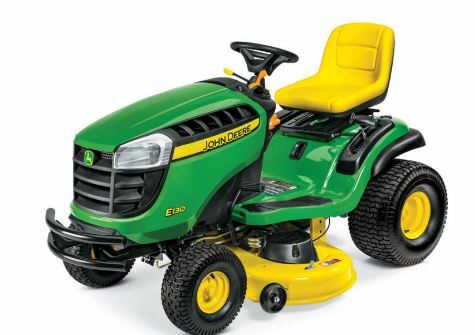 So, this is all about the #price list of John Deere Lawnmower tractor of best tractors to buy in the USA and Canada. 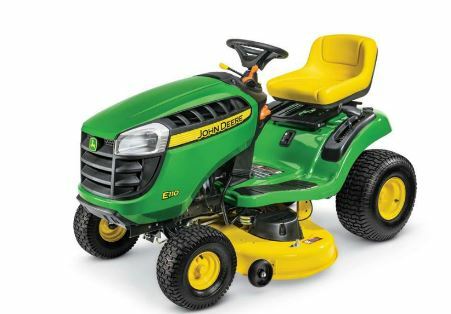 However, please comment, if you are looking for a different one moded from the Deere’s Tractors.